Wholesale Promotional Golf Kits w/ Custom Imprint on Each Item. Deluxe, yet Very Iexpensive. Best Personalized Golf Kits in America. Bulk personalized golf kits, custom imprinted with your logo on every item. The promotional Golf Kit includes one Stainless Steel Budget Mug, one Stainless Steel Divot Repair Tool, one Set of 4 Golf Tees, one Tri-fold Golf Towel, one 6 Pack Cooler Bag, all custom imprinted!. You may choose the color of the 6 pack cooler : see Features, below. We also supply wholesale blank (not imprinted) golf gift kits at next-quantity pricing . Budget Prices in the USA and Canada for wholesale personalized golf kits. American clients pay no taxes, Canadian clients don't pay PST. We will send you a proof for your approval before production. Prices include your 1 color, 1 location custom imprint on each item! Setup Charge is $110.00 for 1-color imprint. Contact us for extra imprint colors. You may order any in-between quantity. 3 Day Rush Service: $0.25 Per Piece. See also our super economy golf gift set . Setup Charge: $110.00 per imprint color, for imprint on every item! Blank Golf Gift Sets: use next quantity pricing. Set Includes: Stainless Steel Budget Mug, Steel Divot Repair Tool, Set of 4 Golf Tees, Tri-fold Golf Towel, 6 Pack Cooler Bag, all custom imprinted! 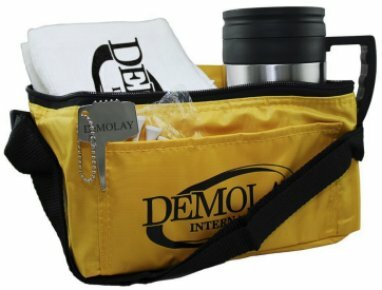 Colors: Blue Cooler Bag, Red Cooler Bag, Green Cooler Bag, Yellow Cooler Bag (featured), Stainless Silver Mug, Black Mug Trim, Stainless Silver Tool, White Tee, White Towel. Typical Production Time: 5-7 days after artwork approval; 3 day rush production is available: add $0.50 per piece.